The 2017 Richmond Bar Guide | Cover Story | Style Weekly - Richmond, VA local news, arts, and events. 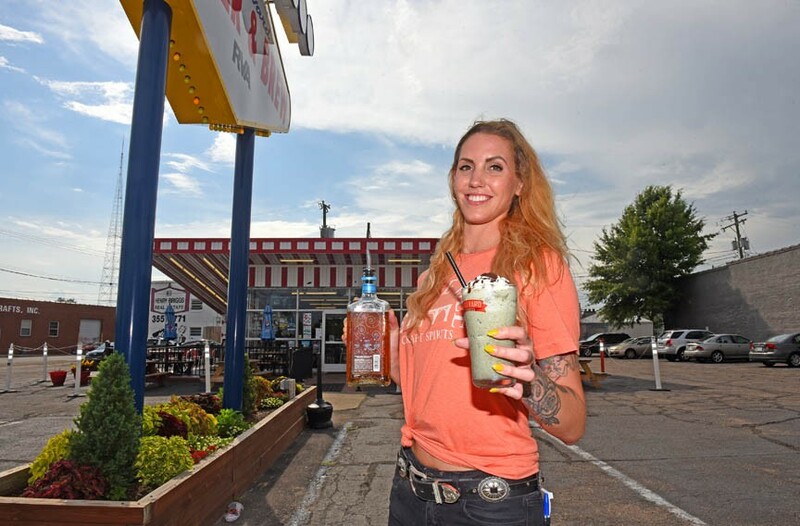 Boulevard Burger & Brew’s bartender Jane Cornell knows the cooling power of an adult milkshake on a hot day in the city. Scandinavia’s signature spirit, aquavit, is commanding the cocktail spotlight, and although the “water of life” hails from the far north, Richmond is putting its own unique spin on the aperitif. Locally, the James River Distillery (jrdistillery.com) launched its own, Øster Vit, which incorporates Virginia-grown corn and discarded oyster shells from Rappahannock Oyster Co. into the spirit, along with caraway, fennel and orange peel for flavoring. “We’re always trying to do something different and interesting,” says Dwight Chew, head distiller at James River. He says that it’s the only distillery in Virginia doing an aquavit — and quite possibly the only distillery in the world adding oyster shells to it. The inspiration came from James River Distillery’s co-owner, Kristi Croxton, who’s married to Rappahannock Oyster Co. owner and restaurateur Travis Croxton, of the Rappahannock restaurants and Rapp Session oyster bar. When she was drinking an oyster shooter (a raw oyster, plus aquavit) at Rappahannock’s bar, she loved the flavor pairing so much that she had a light-bulb moment, Kristi says, and wanted to produce an aquavit incorporating the shells. 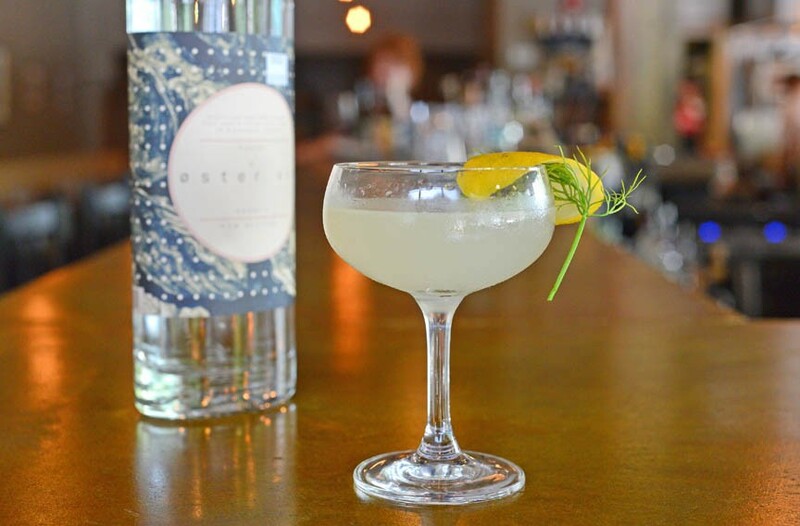 In Rappahannock’s Hedgeman’s Reviver, bar manager Paul Kirk uses dill and absinthe to enhance the botanical characteristics of the Øster Vit. “Because the Øster Vit is much more expressive than a vodka but expresses less powerful botanicals than gins, it makes a cool substitute in cocktails that feature citrus, and in martinis,” Kirk says. 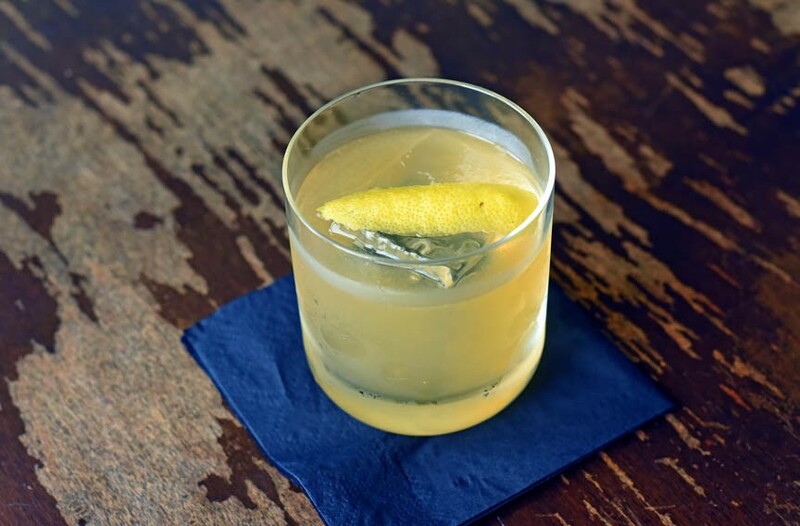 In a shaker, combine the Øster Vit, Cointreau, lemon juice, and Cocchi Americano and shake vigourously. Pour into a chilled, absinthe-rinsed glass, double-straining the cocktail. Garnish with a lemon twist and a sprig of dill. Jessica Bufford thinks of the bar at her restaurant, Toast, as a long, skinny dining table. These days, bars are balancing function with design to create the full experience for diners and drinkers alike. They’re no longer just a place to grab a cold one, but a space within a restaurant where you can stay for an hour or two as you enjoy a three-course meal. Functionally, many things have to fit into the space behind the bar. Beer is on tap, wine bottles are chilled in refrigerators, and fresh ingredients such as herbs and citrus need to be within reach for cocktails. And then there is the commercial-grade equipment such as coolers, the tap system, ice-makers, and computers for receiving and placing orders. “There’s so much stuff you have to cram into such a small space, especially in a cocktail-focused bar,” says Jessica Bufford, owner of Toast, Hutch Bar & Eatery and Talley’s Meat & Three. And all of that behind-the-bar stuff needs to be tucked out of sight so that patrons don’t see the down-and-dirty details of a bartenders’ nightly chores such washing dishes, polishing glasses and juicing citrus. At Bufford’s bars, she’s acutely conscious of the customer experience. She makes sure out-front that her bars have plenty of leg room and that the barstools are comfortable with cushions and backs. “I want it to be just as comfortable as sitting in a booth,” she says. Ambiance also is important. “We view our bar as a really long skinny dining table,” Bufford says. McCormack’s Big Whisky Grill’s owner, Mac McCormack. With 1,300 whiskeys, McCormack’s Big Whisky Grill (bigwhiskygrill.com) is the place to get schooled in spirits. 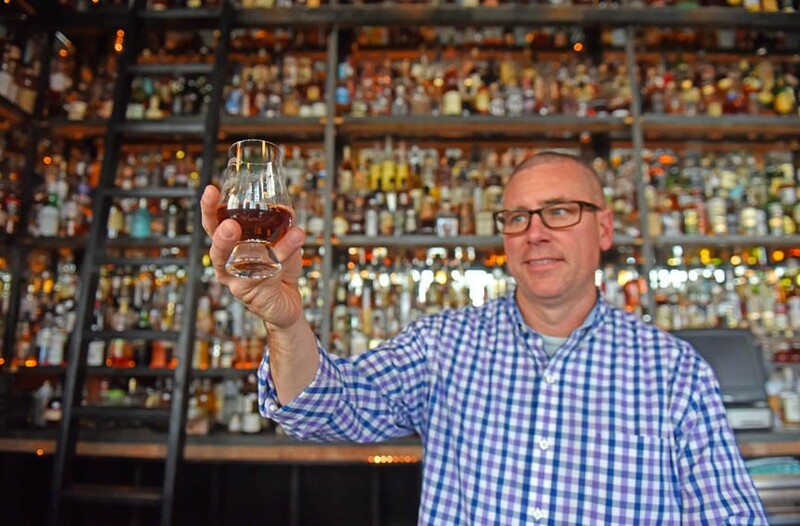 Every Tuesday, the bar’s owner, Mac McCormack, educates patrons in a one-hour course for newbies and aficionados alike that incorporates three to four whiskey tastings. “We taste it together and discuss the nuances of what it is,” McCormack says. Each class provides a new perspective on whiskey, ranging from tequila aged in whiskey barrels to the Japanese take on the spirit. 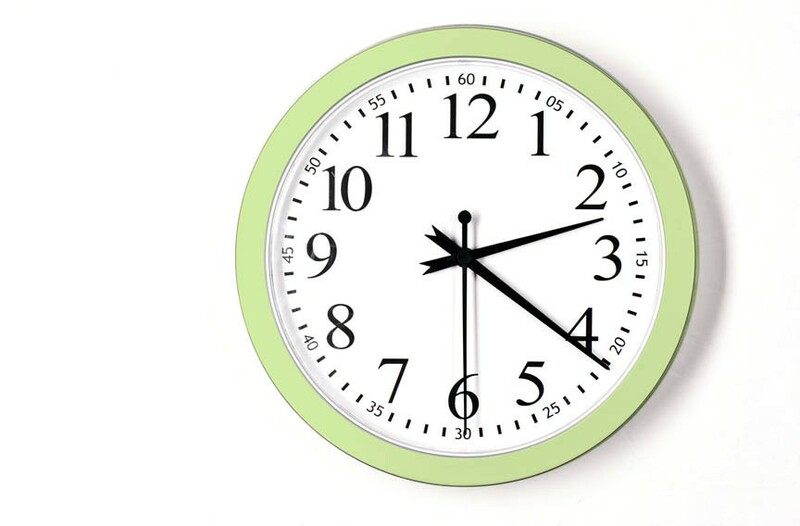 Classes start at 7:30 p.m., and McCormack recommends showing up early and ordering something to eat. Mark your calendars for Virginia Distillery Co.’s event on Aug. 1. At the tasting, distillery director Ian Thomas will discuss single-malt whiskeys. Shockoe Bottom’s Italian eatery Nota Bene held its first sold-out cocktail class at the beginning of June during Negroni week — the bar served six riffs on the classic, as well as informative background about Campari. Currently, the restaurant’s bar team is working on a new seasonal wine and cocktail list, and the next class will be dedicated to summer wine pairings and include a flight. In a town that’s obsessed with beer, it’s as if most people have forgotten about the importance of wine. Was it not our esteemed forefather and Virginian Thomas Jefferson who claimed, “In nothing have the habits of the palate more decisive influence than in our relish of wines?” With that in mind, it’s time for Richmonders to get back in touch with wine. On any given night, you can walk into Bellevue restaurant Enoteca Sogno and owner and wine guru Gary York will impart his wisdom. But it’s his intimate wine dinners that are a truly special experience — he plays host to an Italian vineyard owner or winemaker who discusses the region and its wines, along with a pairing of Enoteca’s seasonal cuisine. The Italian restaurant’s wine dinners fill up quickly, so be sure to get on the email list. The next dinner is slated for mid- to late July. ​Kabana Rooftop makes day drinking stretch past sunset with comfortable seating, wide umbrellas and spectacular views. The arrival of summer signals longer days and with that naturally comes day drinking. If you’re looking to loll over lunch, head to Can Can Brasserie and pretend you’re in a Parisian cafe while people-watching and sipping fine wine. If you work downtown, slip out of the office for a midday getaway, and clear your head with a beverage at Chez Foushee, Cafe Rustica, Pasture, Wong Gonzalez or Secret Sandwich Society. And you can grab a few rays and get comfortable at Kabana Rooftop with a frozen cocktail in hand. If you prefer to cloister yourself indoors for a work date, split a bottle of refreshing vino with friends over a fried chicken sandwich lunch at Saison Market, or segue your afternoon coffee meeting at Rapp Session into an early happy hour with the oyster house’s drink specials that start at 3 p.m.
Possets, eggnog, flips — in three words, there’s the history of alcohol and eggs from the Middle Ages to the 19th century. The three drinks resemble each other — they’re full of aromatic spices, milk, strong alcohol and whole eggs. It wasn’t until the turn of the last century that bartenders, perhaps inspired by meringue, dropped the milk, separated the yolk from the white and created creamy cocktails topped with froth. Egg white cocktails are back, baby, and Laura Lee’s Kacie Shortridge has an easy one that you can make at home. Afraid of salmonella? It’s a small risk, yes, but if you buy eggs at a farmers market and wash them thoroughly, you can lessen the chance of contamination. Combine all the ingredients in a shaker with ice. Shake vigorously and strain. Then, give it a dry shake — that is, shake the drink without ice to give the egg white a chance to froth — and strain it into a glass, garnishing with a sprig of mint. Flora continues the tradition of eclectic music in the back room of the restaurant on Lombardy Street. 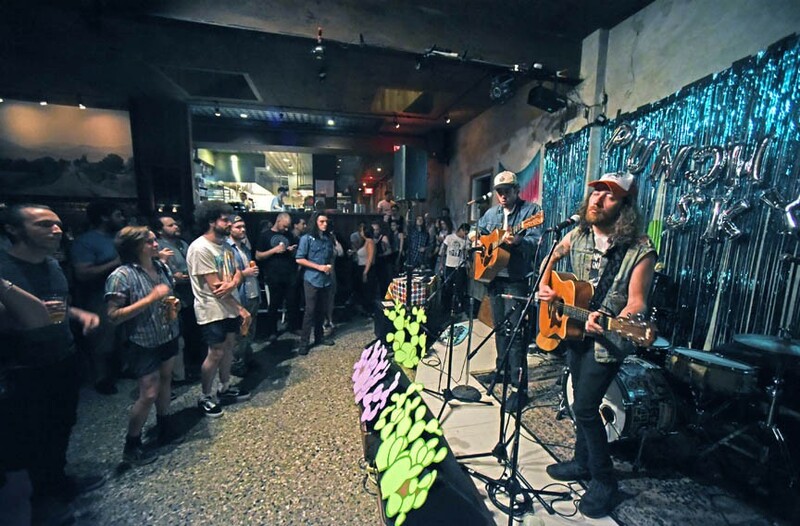 The bar and music scene intersect often in Richmond, with live music and DJs every night of the week if you know where to look. The Camel boasts 28 beers on tap and music seven nights a week, as does Richmond’s premiere hippie bar, Cary Street Café. 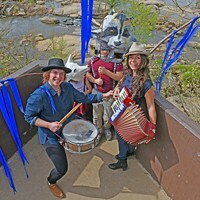 Jazz fans can settle in with cocktails such as the Road to Nowhere at Vagabond, and Flora’s music schedule is eclectic, ranging from emo nights to karaoke to alternative and classical, any of which pair well with a Redneck Riviera cocktail. The Savory Grain mixes it up with easy listening jazz during dinner service some nights and louder shows after dinner on others. 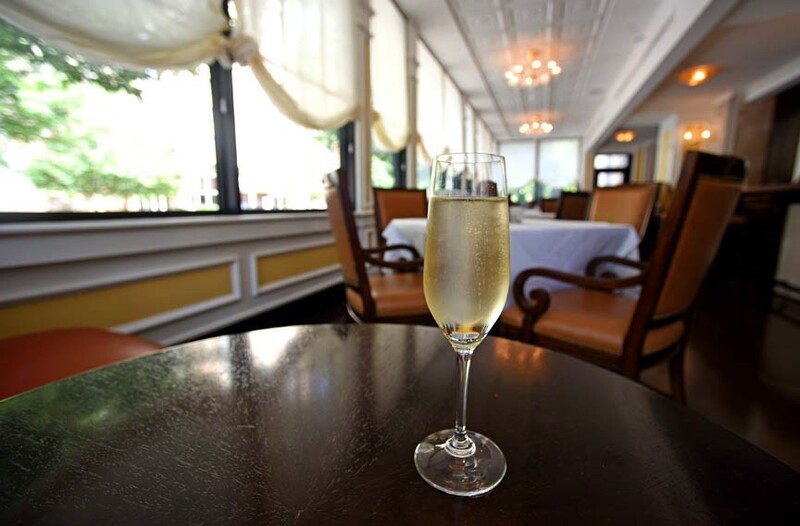 A glass or two of prosecco at Lemaire can summon the glamour you so richly deserve. We all walk around with movie stars hidden within. Although our chances of making it to the large — or small — screen are slim, we can shrug on the feeling like a faux leopard skin coat and burn with glamour in elegant surroundings at spots such as Lemaire or Amuse at the Virginia Museum of Fine Arts. Although you may see a few unknowns quaffing rail liquor in jeans, Lemaire’s Roman templelike bar sets the scene for your entrance. The bar’s back porch feels like a train car and hides you as well as a pair of dark shades while you sip a Café Noir made with Belle Isle Cold Brew Coffee Moonshine, Godiva liqueur and crème de cacao. At the museum, Amuse’s tastefully neutral background brings out the color in your postmodern afterparty. The premiere was a smashing success, and now it’s time to sit at a low table, basking in the purple glow of the bar while nibbling a curried fried oyster or two — not too many! 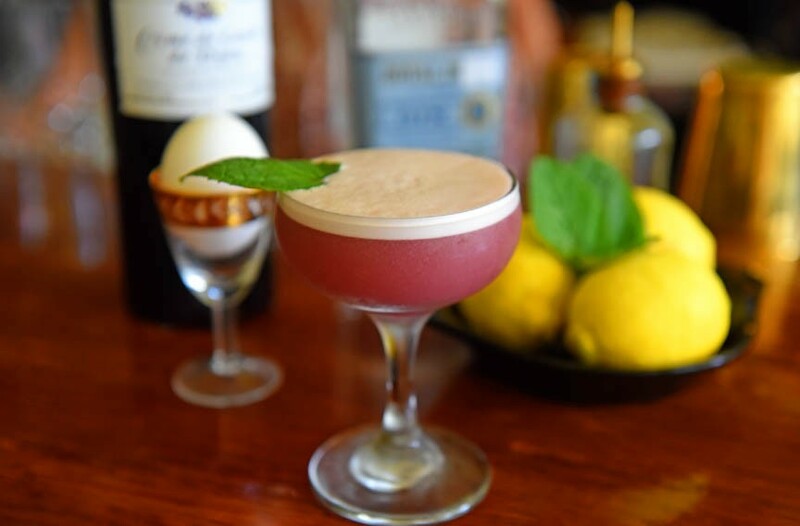 — and ordering a Jet Set Sour ($10), composed of Rittenhouse Rye, bergamot syrup, lemon and red port. At Grandstaff & Stein Booksellers, get ready for your close-up, darling, and show off your inner vamp as you breathe the secret password that will open way to the speak-easy on the other side of the door. The conundrum: When do you drink Boulevard Burger & Brew's adult milkshakes ($9)? If you down a Boulevard malted shake — Stoli vodka, Whoppers Malted Milk Balls and swirled soft-serve ice cream — you probably won’t manage to eat your supper. And if you wait until after your meal, there’s no way that burger and basket full of tots will allow anything else in. The answer, of course, is to make a special trip to this former drive-in and Richmond’s first burger joint. The red-and-white candy stripes of the rooftop have been meticulously restored, along with the original tile. There’s chrome trim everywhere that may not have graced the interior in such abundance during the 50s, but looks like it’s always been there. Although alcoholic milkshakes are nothing new — Galaxy Diner has been making them forever — Boulevard Burger doubles down, offering eight varieties, plus another eight for the nonalcoholic set. Penny Lane Pub is an oasis of Britain for expats such as Paul Marsh, as well as other dedicated soccer fans. Whatever sport and whatever its game, Home Team Grill likely will receive it on one of its many large televisions. On weekdays, you can enjoy happy hour from 3 to 6 p.m.
For soccer, head to Penny Lane Pub — sometimes the bar opens early on Saturdays or Sundays for games — or Lalo’s Cocina Bar & Grill to watch the match with Tecate in hand. If you’re planning to check out the Redskins training camp, pregame a block away at Gus’ Bar & Grill. It’s also a great place to catch college football on the big screen. And don’t forget about your neighborhood haunts: In the Museum District, Buddy’s Place offers beer and food specials during football season, and the Fan Curbside Cafe is an under-the-radar bar to post up and watch your team. In addition, all three Capital Ale House locations are ideal watering holes for beer-and-sports fans. It’s wall-to-wall people on a Saturday night at F.W. Sullivan’s Fan Bar & Grille. 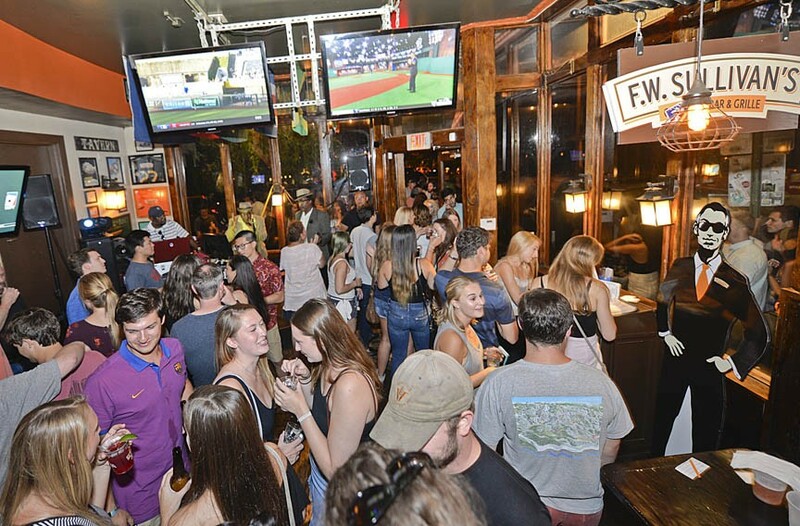 Not for the claustrophobic, nor the faint of heart, a crowded bar means a popular bar, increasing your chances to run into somebody — or many somebodies — you know on a Saturday night. You may have to be your own knight and elbow your way to the front of the mob to order a drink, but you’ll have lots to talk about with your new best friend while you wait. F.W. 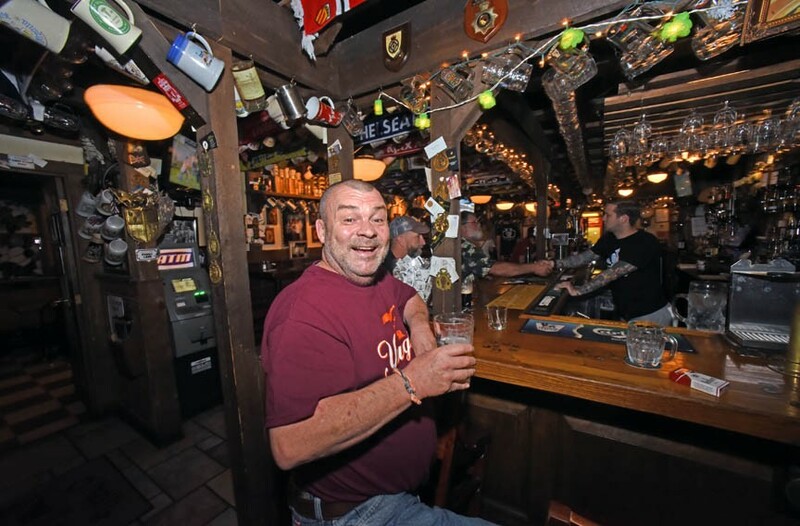 Sullivan’s Fan Bar & Grille takes the word “hopping” to the next level, especially late night, where its extensive beer list is available seven days a week. Wrapped in plastic to take advantage of each and every season, Baja Bean Co. has been attracting the college and recent grad crowd for more than 15 years. Although its subterranean bar under the Stonewall Jackson Professional Center can get a little small, if you find a spot on the patio, you might find a little breathing room. There was a flutter of fear a few years ago when it looked like Baja Bean was going to have to close or find a new home, but so far, its feet seem firmly sunk into West Main Street. How do bartenders get rid of people who don’t want to leave at last call? Bad music seems to be a universally popular method. Up at Patrick Henry’s Pub & Grille, bartender James Menefee recalls that he always hated bartenders blasting white noise over the speakers, so he set out to find a better solution. “When I play the isolated vocal tracks by David Lee Roth from Van Halen’s “Running with the Devil,” he says, “by the “goddamitbabyyouknowiaintlyingimgonnatellyouonemoretimeahhhh” part, people get so mad they head out.” Problem solved. You’ll find a sophisticated update of the lounge bar at the Vintage Room above Pearl Raw Bar. By definition, a lounge bar is the part of a drinking establishment with more comfortable seating. A prime example is the Vintage Room at Pearl upstairs from the raw bar — a walk up the steps leads you to a whole new vibe. 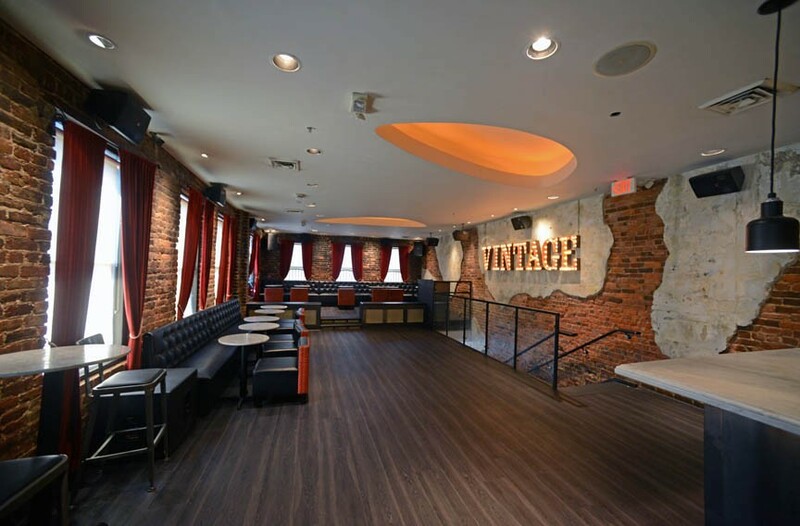 Vintage’s lounge atmosphere is reinforced by low lights and dark velvet-and-leather furniture to set the mood. Nowhere is the lounge bar mood more satisfyingly set than in the Gypsy Tea Room downstairs from Vagabond. Deep couches and a generous banquette ensure that guests are as comfortable as they are at home, albeit with a superior craft cocktail in hand and some of Richmond’s best jazz talent in front of them. And the lounge bar standard bearer for decades has been the Tobacco Co. Restaurant’s first floor atrium bar and cocktail lounge, a magnet for visitors and a reliable source of live music on weekends. Whether it’s sober September, Drynuary or you just aren’t a drinker, it’s frustrating when you’re at a bar and your alcohol-free beverage options are limited to either soda or plain water. While most restaurants don’t list mocktails on their drink menu, you shouldn’t be afraid to request a special booze-free concoction from the bar. Nonalcoholic spritzers and smashes are easy for bartenders to whip up. With soda water, citrus juices, a variety of fresh herbs and fruits, plus simple syrups or other sweeteners such as honey, there are an array of tasty combinations that bartenders can create. And don’t forget trendy shrubs, which will add a vinegary zing to your drink. For a nonalcoholic mojito, ask for a soda water with mint leaves, lime juice and honey. On hot days, stay cool with a different riff on the classic summer cocktail — coconut water enhanced with cucumbers, plus lime, sugar and mint. Or if you’re feeling fruity, you can’t go wrong with a soda water topped off with cranberry juice, lime juice and a little simple syrup. What is it about hotels that makes us think about nightcaps? Perhaps it’s that a bed is within a short distance of a bar? If ambiance and proximity to a bed is important, fancy hotel bars such as the Jefferson’s Lemaire and Quirk Hotel’s Maple & Pine Restaurant, as well as its rooftop watering hole are perfect spots to grab a nightcap. At Quirk, try the port and pair it with dessert. At Lemaire, there’s a wide variety of liquid desserts that range from the wintery Irish coffee to sweet wines and cordials. Part of the pleasure of patios are their people-watching opportunities. The Daily Kitchen & Bar combines that with a menu full of cocktails, mocktails, beer and kombucha. Throughout Richmond, there are plenty of patios to soak up the day — or night — with an elixir in hand. We can only scratch the surface in this space. 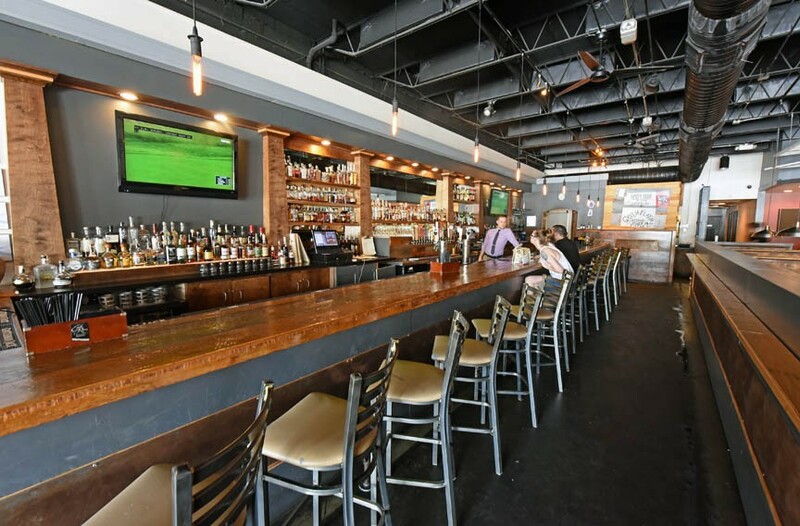 East Coast Provisions and the Daily Kitchen & Bar in Carytown have excellent drinks that pair well with lunch or happy hour bites. 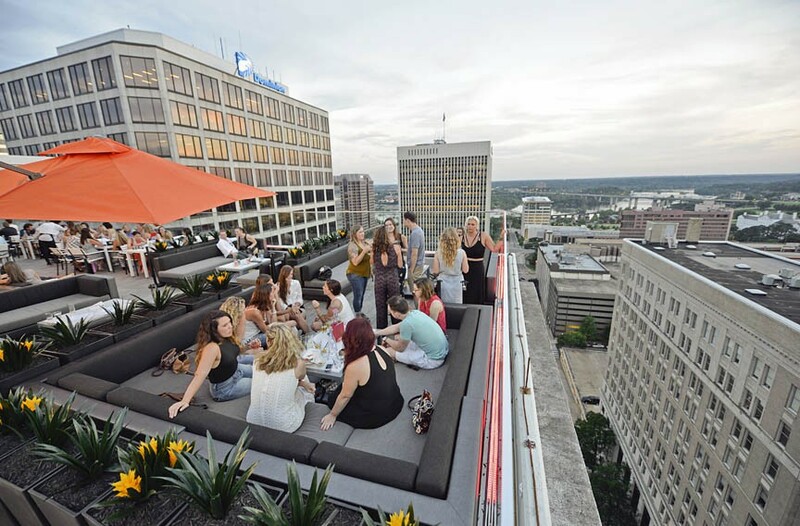 Downtown, embrace the cosmopolitan life at Kabana Rooftop. The Sidewalk Cafe never may have managed, sadly, to actually get seating next to its sidewalk, although its sibling, Kitchen 64, with lunch and dinner specials seven days a week, has a view of the Boulevard from what started as a deck and morphed into a pretty permanent-looking front porch. 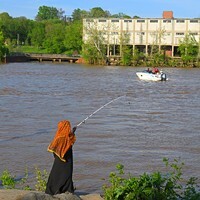 Romantic views can be found at the Boathouse’s locations and don’t forget to eyeball the river from Legend Brewing Co.’s wide deck before Manchester development obscures it. 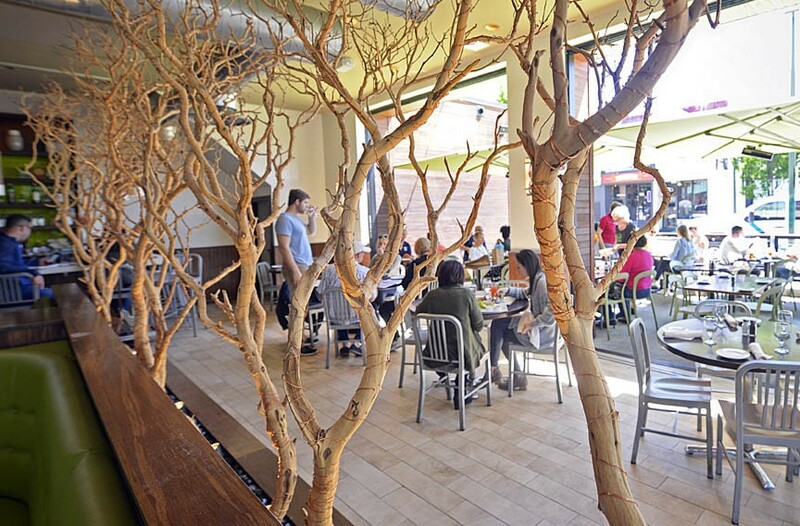 A few unexpected spots have hidden outdoor seating: Ask for directions at Foo Dog, Don’t Look Back, Northside Grille or the way to the volleyball court at Babes of Carytown. More outdoor havens include Southern Railway Taphouse’s massive space and Siné Irish Pub and Restaurant’s cobblestone view in Shockoe Slip. The Fan has a few — although they’re relegated to the edges — such as Starlite Dining and Lounge, Three Monkeys and up top at Postbellum. In the West End? Try Patina Restaurant and Bar’s outdoor seating and order a dozen half-price oysters during happy hour. On warm summer nights in South Side, stop by Plant Zero Cafe, now serving dinner. Who started Richmond’s patio craze? Jason Alley, that’s who — he tirelessly lobbied the city to change its zoning laws to allow it. Perhaps we all ought to thank him by having one of bar manager Beth Dixon’s imaginative cocktails out front of Pasture on East Grace Street. 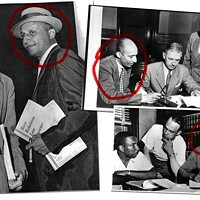 Punch finds its Richmond roots in the Roosevelt’s version of Quoit Club Punch, once sipped by U.S. Chief Justice John Marshall. 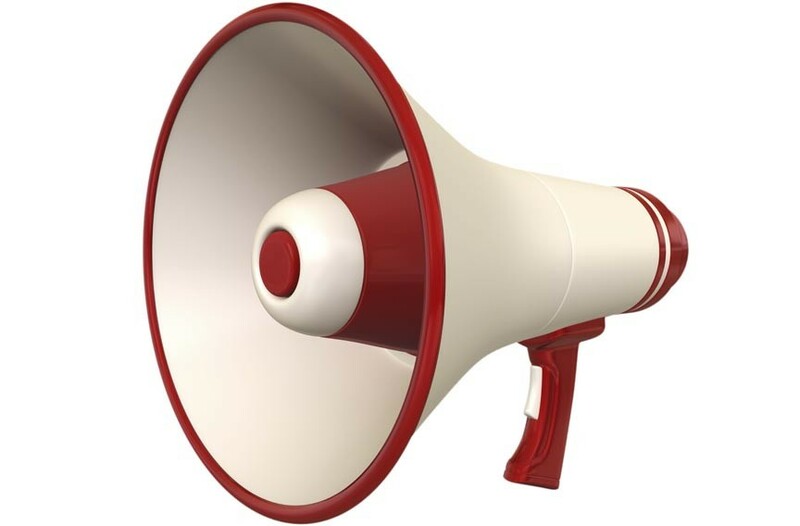 I have something to say and I want you to hear it. Far from the madding crowd — or at least the crowd that makes you mad — you can sit with a friend and sip a drink while exchanging intimate confidences at 23rd & Main Kitchen & Taproom. When you’re done, gently tap your Moscow Mules together to celebrate the gift of audibility. Secco Wine Bar will offer you a flight and exquisite bar treats without all the hullabaloo, and even Joe’s Inn in the Fan has settled down in its old age with sheltering booths and a conscientious staff that can hear you when you place an order. 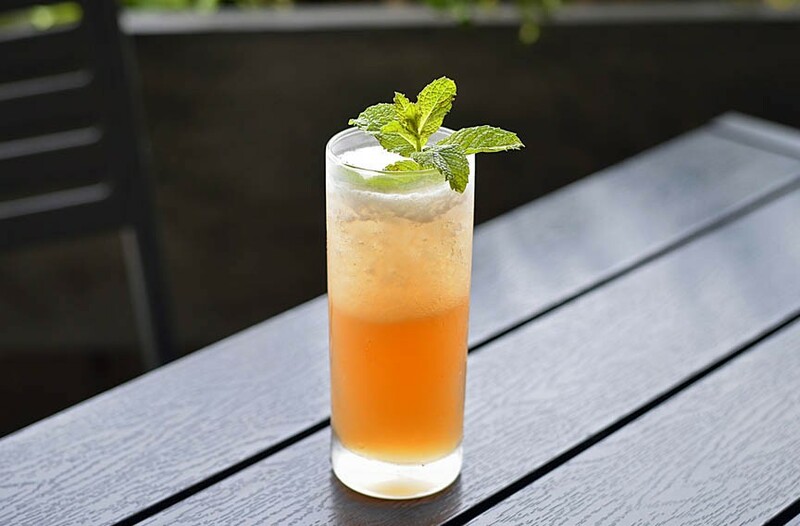 Rum is hot, hot, hot on the bar scene — ingredient-wise — and during a sultry evening in Richmond, it goes down easily with cool mint and lime. 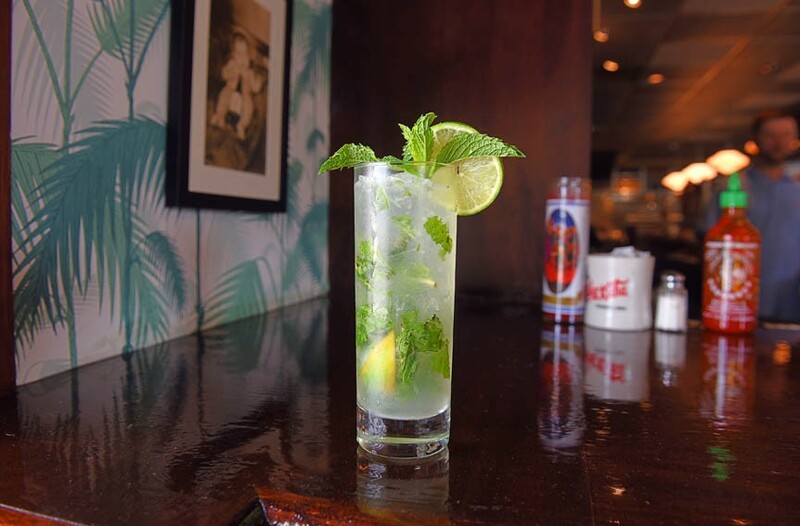 Kuba Kuba owner Manny Mendez knows more about rum than just about any other Richmonder, and here he shares a recipe for a classic mojito. Muddle the mint leaves, sugar and lime juice in a shaker. Add rum and fill shaker with ice. Shake well and pour into a Collins glass, garnishing with a lime wheel and mint sprig. Optional: Add club soda for the American version. Acacia Mid-Town offers cocktails such as its Acacia Tiki made with overproof rum, coconut liqueur, falernum (a rum-based syrup infused with citrus and aromatic spices), lime and pineapple juices, and Angostura bitters. If you’re eschewing the supper crowd, sidle up to the bar for early-bird and late-night bar specials for your ticket to dine. Head over to Acacia Mid-Town for its daily happy hour, 5:30 to 7 p.m., that includes $3-off mixed drinks, $2-off beer and $2-off wine by the glass. The bar menu also offers dishes that range from smaller bites such as marinated olives, toasted nuts and white anchovies ($6) to filling meals such as the crab cake or soft-shell crab sandwiches ($15). Before dinner service begins, Stella’s offers appetizers and drinks at the bar starting at 4 p.m. You’ll find wine carafe specials, a daily featured cocktail, along with snacks such as meatballs, octopus, and spanakopita . ($4 to $6). And if late-night is more your style, stop by Heritage for its evening bar deals, which include an array of snacks and craft cocktails on Thursdays from 10 p.m. to 2 a.m., and Fridays and Saturdays from 11 p.m. to 2 a.m. 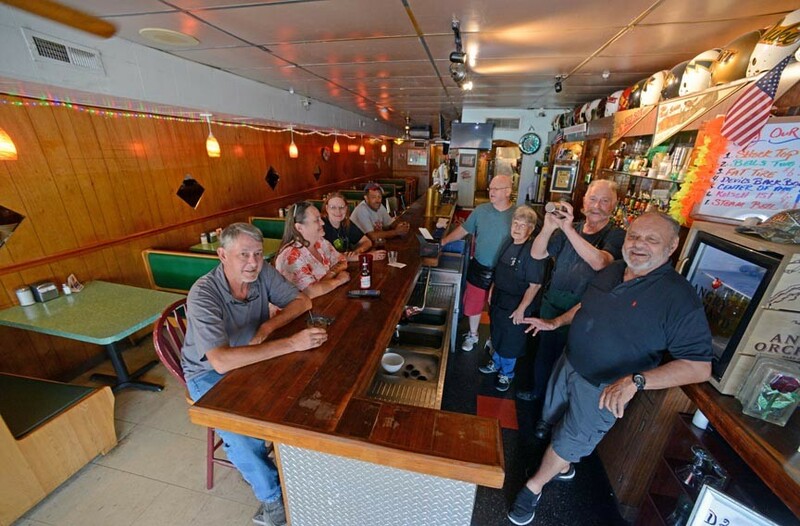 The Rose Marie Inn’s regulars keep coming back for the bar’s timeless ambiance. Richmond’s bar culture has changed so dramatically in the past seven or eight years that it’s hard to remember how basic it used to be. Hanging on throughout the uptick in craft-cocktail worship are the homey dive bars that ignore trends and stay frozen in time, much to the delight of their loyal regulars. Besides cheap drinks and cigarette machines, unaffected dive bars can always be counted on for a great, if classic rock-leaning, jukebox. The Mediterranean comes to Main Street at Nota Bene, where you can find both traditional and creative riffs on Italian cocktails. While attached to your bar stool, set sail to another part of the world with the following beverages found around town. Mexico and the Yucatan Peninsula: Sipping on a tropical cocktail at Flora, you can’t help but think “¡Olé!” The new eatery embraces the flavors of Oaxaca, in Mexico. For its riff on the Paloma ($8), Flora’s bartenders whip up a homemade batch of oleo sacchrum, an aromatic syrup made from citrus peels, allspice, sugar, berries and black peppercorns. The syrup is then combined with tequila blanco, Aperol and citric acid. They throw it all in a keg, carbonate the concoction and then bottle it. The final cocktail is served with a dash of hopped bitters and garnished with mint. Flora also has a series of mescals and soon will offer a new lineup of wild mezcals at the bar. Mescal is distilled from agave plants — usually farmed. These wild ones come from the errant species of the countryside. “The conversation about Oaxaca can’t be had without talking about wild mescals,” says co-owner Jay Bayer. “It’s such an unbelievable part of Oaxacan culture.” For a true cultural experience, be sure to pair a glass of El Jolgorio mescal with chapulines — fried grasshoppers. 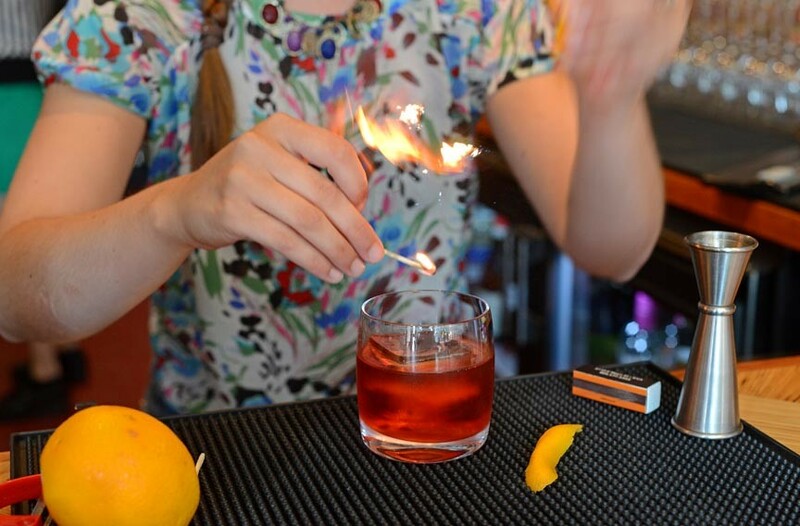 Italy: For a true taste of Italy, stop by Nota Bene to sip on amaro. The dry, bitter Italian herbal liqueur helps to kick your appetite into gear before dinner, while also, the Italians say, aiding with digestion. Including Aperol and Fernet Branca, you’ll find an array of amari, and the restaurant even notes digestif suggestions alongside menu items. “We’ve paired the dessert and afterdinner menu so that people have a full experience from start to finish,” says Nota Bene owner Victoria DeRoche. For instance, the restaurant recommends its local goat cheese custard ($6) to be accompanied by Cardamaro and its chocolate almond cake ($6) to hitch a ride with Luxardo Amaretto di Saschira. Cocktails such as the Sorrentino, made with limoncello, Campari, Barolo Chinato and soda water ($12) and the Appennini Spritz — Cocchi Barolo Chinato, Cappelletti, prosecco and lemon juice ($9) capture the Italian spirit. Asia: At Beijing on Grove, bar manager Jonathan Kibiloski is adding an Asian twist to the classics. 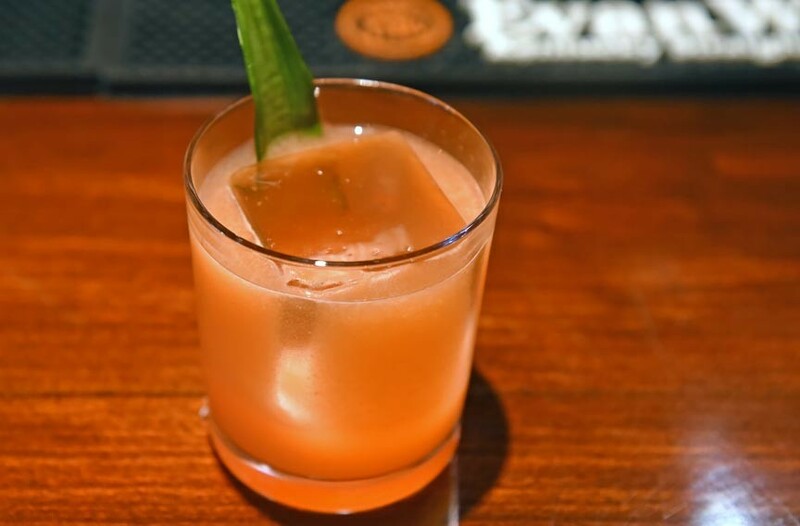 “With our cocktails we want big, bright drinks that complement the [Cantonese] food,” Kibiloski says. The Kung Pao is a spicy riff on the old fashioned with toasted peanut honey, rye whiskey, mole bitters and chili pepper liqueur. Kibiloski created the Samurai Warrior as a nod to the Negroni. It’s a concoction of pink lady apple-infused sake, Campari, Byrrh and Yellow Chartreuse. And the bar’s One Night in Bangkok pays homage to the Harvey Wallbanger with Cirrus vodka, Campari, Asian pear, lime, and orange. Imported beers include the usual suspects — Sapporo and Tsingtao — along with the more unusual Hitachino Nest Espresso Stout. In the future, the restaurant is looking to expand its sake offerings. It may only be 12 miles from the Fan, but the Lilly Pad Café in the East End feels a world away from city bars. The cinder block building sits beside a marina on the James River, so it attracts boat traffic, and given its accessibility on the easy-riding Osborne Turnpike, motorcycle traffic as well. Hardly the place for craft cocktails, the Lilly Pad excels at cheap mixed drinks and plastic buckets of Budweiser enjoyed most often on the patio with accompanying wafts of the James River, occasional live music and splendid sunset views. There are no shrubs or house-made bitters at the Lilly Pad — and its devotees like it that way. Promises, promises: Richmond hears a lot about new bars and restaurants, but some of the most unusual are planned for Scott’s Addition. If drinking while gaming is your style, this year you might be able to channel the Dude and grab a ball at River City Roll. Owners Rob Long and Ben Eubanks are calling it boutique bowling, and they plan to add Skee-Ball and live music in addition to the upscale alley’s 20 lanes. But wait — Rob Lupica is planning his own version with pinball and vintage arcade games. He plans to install self-service taps similar to the ones slated for the nearby Richmond Wine Station. And mere blocks away from both arcade bars, Pasture and Comfort co-owners Jason Alley and Michele Jones are joining Flora partner Jay Bayer of Saison, along with Ted Ukrop, to revamp the old bingo parlor at West Broad Street and Summit Avenue. They, too, are planning to bring in pinball, classic video games and Skee-Ball. This last venture, dubbed Bingo, will also sport a 15-barrel brewing system, making it the eye in the hurricane that Scott’s Addition has become. There are two types of people: Those who avoid loud bars and those who feed off their energy. The latter gravitate to places such as GwarBar and Social 52, where patrons know you’ll need to bring your outside voice if you hope to be heard. Even at weekend brunch, District 5 sounds as loud as a club on Friday night, bass booming and patrons carrying on as if it’s still dark. Commercial Taphouse & Grill, with its low ceilings, and Postbellum, with high ceilings, both qualify as hard on the hard-of-hearing, with decibel levels that suggest a party in full stride. Long a fixture in cities such as San Francisco and Tokyo, the izakaya concept has hit Jackson Ward thanks to Rogue Gentlemen owner John Maher and his casual Japanese tavern, Yaki, which opened this spring. It’s a cozy 12-seater bar with additional tables that offers guests a chance to enjoy the late-night bar scene typical of the izakaya, with a focus on yakitori — Japanese skewered chicken, and in Yaki’s version, skewered vegetables, too — cooked over an extremely hot, smokeless grill. Amateur mixologists, here’s your chance to shake up a Yaki original at home. For those not endowed with a cocktail shaker, the Japanese tavern is open daily from 6 p.m. to 2 a.m.
Add the ingredients to a cocktail shaker. Shake with ice for 45 seconds. Double strain the cocktail over a large ice cube. CORRECTION: The last quote about James River Distillery's Øster Vit was originally attributed to Rappahannock and Rapp Session’s general manager Danielle DiBlasio, but should have been attributed to bar manager Paul Kirk.